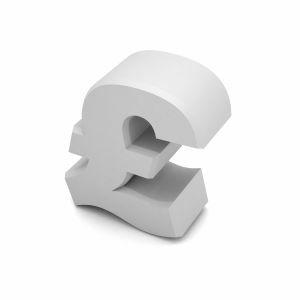 The basics of pricing should lead you to set up a price which in line with your costs allow you to make a profit. However, there are limitations from the external perspective, like the level of competition in your market segment and the pricing of your competitors. Focusing on the financial side of pricing, which you could deem as an internal perspective, unit fixed costs decrease with your sales, while unit variable costs are constant with sales; so then, as sales increase turnover allows for covering the variable costs (whenever the selling price exceeds the unit variable cost) and part of the fixed costs. The break-even point is the level of sales when turnover will just cover both costs, leading the company to abandon loses. The break-even point is the level of sales which is a minimum for the company to start making a profit. To obtain this in terms of units and currency, input the figures for your fixed costs, the variable cost and the unit price. We have developed and Android calculator that indicates the number of units that allow your company or project to reach break-even. We are recommending you to use it to simulate different scenarios of costs and prices. 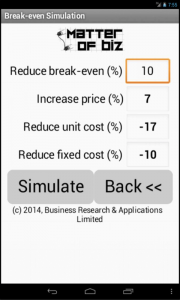 The simulation screen can be used to find out the different possibilities for reducing the break-even point: price increase, variable cost reduction, fixed cost reduction. For instance, for a unit price of 10 pounds, with 4 pounds of variable cost and 500 pounds of fixed costs, reducing the break-even by 10%, such company should increase the price by 7%; otherwise, it could reduce the unit cost by 17%, or the fixed cost by 10%. Obviously, there is the mixed approach, and the company could try a combination of all three perspectives. Another possibility would be trying to change the different combination of sales, whenever the company is selling different goods or services (the sales mix). This calculator will allow you to simulate your sales with up to three different products. You can download it from the Google Play store (Simple Break-even Simulator).